Picking party decorations and party favors for your child's 1st birthday can be exciting, but also feel a bit daunting. If you're going with more of a general approach over a themed one year old party, you'll still find plenty of ways to decorate and numerous age-appropriate favors for a first birthday. Choose birthday items that are unique to a 1st birthday, in addition to buying the standard birthday party supplies. 1st birthday banner: You can print the banner on your computer or buy a custom banner with your child's name on it to use for several years. Special bib or hat: Buy a bib that says "My 1st Birthday" on it, or a hat with candles. 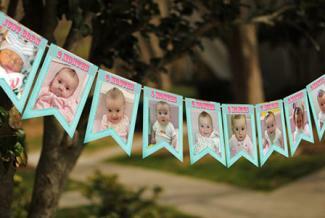 Photo banner: Make a photo banner documenting your child's first year of life. Use a picture from each month, and cut in a circle to fit into the middle of colored paper plates. String the plates together and hang. You can also use clothespins, photo mats, and other decorations to create a personalized photo banner. Shaped cake: Get a cake that is shaped into a number 1 or is the same shape as your theme (such as rubber ducky, tractors, or bears). High chair decorations: Decorate the guest of honor's "throne" using high chair decorations. A flag or pendant banner that hangs along the front and proclaims it's the 1st birthday is a perfect touch. A mat that matches the theme and sits under the high chair will catch falling cake. You also may want to pick up some stain remover and extra towels, especially if you will have lots of toddlers at the party. Even adults can spill, so be prepared for accidents. 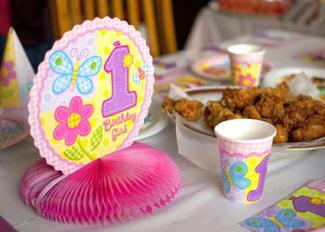 Partypro.com offers dozens of 1st birthday supplies, including hats, centerpieces, and accessories for either gender. The site offers personalization on many of the decorations and party favors. Shindigz offers both popular and innovative items for a 1st birthday party, some with customization. Search specifically for the type of decoration you need, whether centerpieces, balloons, hanging decorations, or other supplies. Favors range from bubbles to toys to edible treats. Birthday Direct carries 1st birthday theme supplies that are organized by over 60 themes, although you can pick and choose whatever you like from each if you don't have a theme. They also have solid color party supplies as well. You can find items for up to 50 percent off retail pricing. Hang banners, danglers, balloons, and other decorations out of the reach of small children. This prevents the children from chewing on and possibly choking on any decorations. It also alleviates you and the other parents from having to toddle after toddlers all day trying to keep them from touching the decor. It's unlikely that one year olds are going to sit in their high chair or at small tables and chairs throughout the entire party. You can make these items available at the party for the times when the kids do want to sit. Decorate additional high chairs and toddler-sized chairs with large ribbon bows tied securely to them so kids can't remove them. Focus on creating an open space where they can play with toys, roam, and interact. 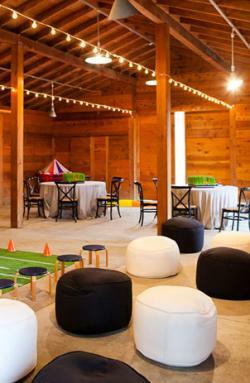 Provide toys, books, stuffed animals, and large building blocks that the children can play with during the party. Borrow or rent enough chairs for the parents to sit since many will opt to stay if their child is only about a year old. If you're hosting the party outside, in a party room, or have enough room in your home, you can also rent small round tables or set up card tables. Cover the tables in linen or plastic table covers that match the theme or color of the party. Party favors for one year olds can be a little tricky. Some have teeth, some are still working on growing some. Some are eating baby foods while others are eating solids. Some parents let their kids munch on candy while others are afraid it's unhealthy or a choking hazard. These ideas for party favors are appropriate for the youngest members of the party. Bathtub squirters: Most kids like playing in the bathtub, so pick out some fun squirt toys they can play with after the party is over. Packages usually come with several so divide them among the kids. Look for ones that match the color or theme of the party. 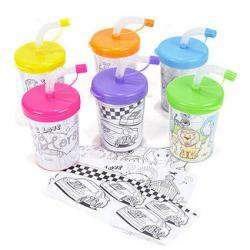 Sippy cups: One year olds are usually drinking out of sippy cups, and may even be transitioning to straws and cups. Find cups that the kids can make with their parents, like a color your own set. They can use the cups at the party and take them home to use later. Piggy banks: It's never too early to start saving for college (or a rainy day). Hand parents mini banks that are pigs or in the shape of something that relates to the party theme that they can place on a safe shelf in their child's room. Drop a penny in each bank to get them started. You can personalize the bank with the child's name or put your child's name and event, along with the date, to commemorate the day. Coloring books and crayons: Supply a set of crayons and a coloring book for each child. They can color while they are at the party or take the fun home to enjoy later. Getting all the 1st birthday party items is only the beginning of planning a successful birthday party. Once you have your theme chosen and supplies bought, you need to do several other things to make sure your child's birthday party is a success. Have an area in the nursery or one of your bedrooms where moms can change their babies' diapers. You can supply some wipes and diaper rash cream if you wish. Otherwise, have a mat or cushion available for changing, along with plastic bags or a trash can for disposal. Add decorations to the basket holding the diapers and wipes, like tying on balloons or adding a big bow, so it appears as if it is part of the party rather than an afterthought. One outfit should be for most pictures, such as posing with the cake and opening presents. 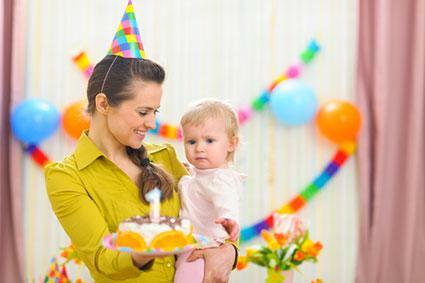 Most party supply stores offer 1st birthday clothing so that it matches the theme of the decorations and party favors. You can even have the items personalized with your child's name and the fact that it's their 1st birthday. The second outfit will be worn during cake time as many parents do a "smash" cake and a special outfit may get ruined. When packaging the favors, try to avoid using items that an be choking hazards for your children. Stay clear of thin ribbons, cellophane, or small embellishments. Consider using paper cones or boxes. Some favor cones or boxes come pre-printed with the theme that matches the decor. You can use rubber stamps or stickers to decorate plain boxes to match the décor for the party. A successful party depends on the birthday items you choose to decorate with and takes some careful planning. The right combination of decorations and party favors can really set your child's 1st birthday party apart from the rest.